It is a time of significant change for energy policy in Scotland. 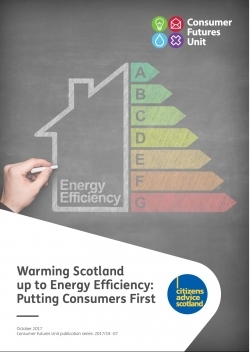 In a context of increased devolution of powers from the UK level, the Scottish Government is developing an ambitious Climate Change Bill, and will also soon be launching a new Energy Strategy and setting new objectives for tackling fuel poverty. A major plank of this change will be Scotland’s Energy Efficiency Programme (SEEP). The main finding from our in-depth deliberative research with homeowners is that a new incentive system based upon a level of prompt Council Tax rebate for those homeowners who install energy efficiency upgrades would be, by some margin, the most popular of the incentives we considered. In the case of SEEP, a critical foundation for the programme is consumer buy-in, both for the objectives and the measures necessary to achieve them. Therefore, to promote energy efficiency measures and, if required, to increase the public’s openness to regulation in this area, we recommend that substantial efforts should be made to lead and transform public opinion on the real benefits of installing energy efficiency measures.